I am your GFC follower - sonidlo. I follow you on Twitter and my username is zarapetkovic. Thanks for the giveaway, and happy New Year! I follow as Smoochiefrog both here and on Twitter. Another give away? :D Awesome ! I've been lusting after this polish for a while now! I'd love to win it! I follow your blog via GFC as Barb and on twitter as BLagro. Have a lovely New Year !! I follow you on twitter as attackedastoria. im lemming zulu like crazy lately. great giveaway! Wow, I love that green! :)). Please, enter me - I follow via gfc (blanche.b[at]gmail[dot]com). I posted your giveaway in my sidebar http://polishdrop.blogspot.com. Lol, "Zulu" in Maltese - I'm from Malta - translates "out of my way" in English. It seemed so funny when I heard about this giveaway. Thanks a lot and happy new year!!! I'm a follower as Biba. I haven't tried Nars yet so this giveaway is perfect. I follow through GFC as Michelle and on twitter @TheSassybeauty. I am a follower and I would LOVE to win! Happy New Year! I wish you all the best and I hope you continue sharing with us the great work you do win your blog! Despite commenting little I am a regular follower of it so I wish you keep up the great work! I'm also anxious to enter your giveaway, please count me in: I follow you as Akuma Kanji, my e-mail is akuma[dot]kanji[at]gmail[dot]com and, I hope it counts, I blogged about your giveaway on the sidebar of my blog, here http://poom-poom-nails.blogspot.com/ *thank you for the opportunity! This is a nice shade! Thanks! thanks for this giveaway and i wish you an happy new year. Please enter me in your giveaway! I've been following you as Cheryl on GFC and my email is cherylcherylcheryl(at)gmail(dot)com. I blogged about it here: http://legallypolished.blogspot.com/2011/01/giveaways.html and I'm also following you on twitter as ch3ryl89. Thank you for this giveaway! My GFC is sole. And I follow you via twitter as soledsun. Enter me please! I'm a follower on GFC. I'm fisiwoman. Already follow you on Twitter as @monikaretnani. Blog about this giveaway on my giveaway page here. Hey! I follow via GFC as mrgee, and my email is kit_kat_74(at)hotmail(dot)com. Great Giveaway that polish is soo pretty! my google follow username is eve holt. hi! i'm a GFC follower - LilMee. I follow via GFC and twitter both as fennelbat. I am a GFC follower calvad. calvad(at)aol(dot)com. Awesome! I'm a new follower; GFC as Kendal. I followed you on Twitter via heartkendal! im a gfc follower you nailed it! Hi, I follow your blog publicly via Google Friend Connect as shala_darkstone. I follow you on Twitter (@shala_darkstone). Thanks so much for the giveaway! I just found your blog and loving it!! Hi, I'm a follower via GFC (Kvacka), please enter me! I'm a GFC follower (same name & email I'm commenting with). I love the color! Following you on Twitter: Megweno. I am following you on twitter @lilofeverything. Oh what a wonderful polish, please enter me in your giveaway!! 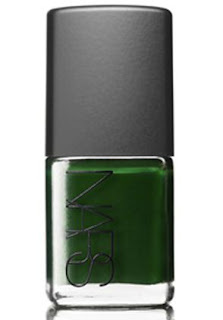 I love green, I LOVE green, and this polish is a wonderful one, really... thank you for such a nice idea!! Thank you, and have a great day!! Cool giveaway for a great product. I now following GildedNails. Thanks for a great giveaway! I love giveaways and following you on google.